Practical Bible Teaching: WHAT DOES IT MEAN TO SEEK THE LORD? Outside of the religious circles of Christianity, is this phrase ever used? In any kind of a context? EDITORS NOTE: While looking for verses and definitions for this article, I came across the following article by John Piper. He says everything I had on my heart, and then some. Seeking the Lord means seeking his presence. 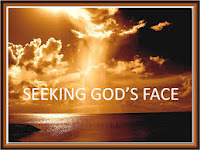 “Presence” is a common translation of the Hebrew word “face.” Literally, we are to seek his “face.” But this is the Hebraic way of having access to God. To be before his face is to be in his presence. But aren’t his children always in his presence? Yes and no. Yes in two senses: First, in the sense that God is omnipresent and therefore always near everything and everyone. He holds everything in being. His power is ever-present in sustaining and governing all things. And second, yes, he is always present with his children in the sense of his covenant commitment to always stand by us and work for us and turn everything for our good. “Behold, I am with you always, to the end of the age” (Matthew 28:20). But there is a sense in which God’s presence is not with us always. For this reason, the Bible repeatedly calls us to “seek the Lord . . . seek his presence continually.” God’s manifest, conscious, trusted presence is not our constant experience. There are seasons when we become neglectful of God and give him no thought and do not put trust in him and we find him “unmanifested” — that is, unperceived as great and beautiful and valuable by the eyes of our hearts. His face — the brightness of his personal character — is hidden behind the curtain of our carnal desires. This condition is always ready to overtake us. That is why we are told to “seek his presence continually.” God calls us to enjoy continual consciousness of his supreme greatness and beauty and worth. This setting of the mind is the opposite of mental coasting. It is a conscious choice to direct the heart toward God. This is what Paul prays for the church: “May the Lord direct your hearts to the love of God and to the steadfastness of Christ” (2 Thessalonians 3:5). It is a conscious effort on our part. But that effort to seek God is a gift from God. We do not make this mental and emotional effort to seek God because he is lost. That’s why we would seek a coin or a sheep. But God is not lost. Nevertheless, there is always something through which or around which we must go to meet him consciously. This going through or around is what seeking is. He is often hidden. Veiled. We must go through mediators and around obstacles. The heavens are telling the glory of God. So we can seek him through that. He reveals himself in his word. So we can seek him through that. He shows himself to us in the evidences of grace in other people. So we can seek him through that. The seeking is the conscious effort to get through the natural means to God himself — to constantly set our minds toward God in all our experiences, to direct our minds and hearts toward him through the means of his revelation. This is what seeking God means. And there are endless obstacles that we must get around in order to see him clearly, and so that we can be in the light of his presence. We must flee spiritually dulling activities. We must run from them and get around them. They are blocking our way. We know what makes us vitally sensitive to God’s appearances in the world and in the word. And we know what dulls us and blinds us and makes us not even want to seek him. These things we must move away from and go around if we would see God. That is what seeking God involves. The great promise to those who seek the Lord is that he will be found. “If you seek him, he will be found by you” (1 Chronicles 28:9). And when he is found, there is great reward. “Whoever would draw near to God must believe that he exists and that he rewards those who seek him” (Hebrews 11:6). God himself is our greatest reward. And when we have him, we have everything.